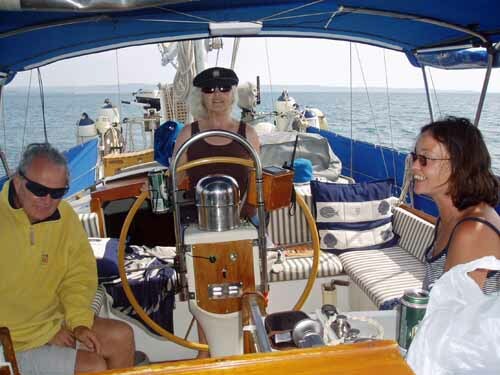 Is a Center Cockpit Sailboat as Practical as an Aft Cockpit Sailboat? As I see it, the main benefit of a center cockpit sailboat is that it provides space below for a large aft cabin. A pal of mine once had a boat show salesman speechless when being led into the aft cabin (sorry, 'the owner's stateroom') of a 45ft (14m) centre cockpit sailboat, "Good Lord" he said, "It's a fornicatorium!" Well, I know what he meant. A king-sized walk-around bed with en-suite facilities, it would've stood comparison with an upmarket honeymoon-hotel bedroom. It certainly provided a level of privacy and seclusion not normally found on a sailboat; an in-harbour refuge par excellence, separated from the rest of the interior accommodation by a walk-through passageway along the starboard side. At sea though, this type of aft-cabin is not so good. In fact, it's pretty much a waste of space other than as a store room, as the occupants of the bed would soon find themselves rolled out onto the cabin sole. Some sailboat manufacturers, wrestling with the cost versus size versus accommodation conundrum and seeing such commodious aft cabins as huge selling points, produce center cockpit sailboats that end up being less than successful for offshore cruising. In these the cockpit sole has been raised to accommodate access below which in my view doesn't make for seaworthy sailboat design. 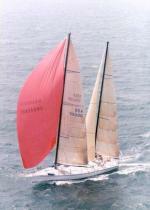 In such sailboats the sensation for the crew is of being perched insecurely on the cockpit rather than being securely protected within it. But it is possible to produce a smaller center cockpit sailboat with a comfortable double berth aft cabin without compromising cockpit security, but at the expense of access to it. Gone will be the passageway connecting it to the rest of the accommodation, now access to it will be through a forward facing companionway leading from the cockpit. It's too remote from the rest of the accommodation. Shut away in the aft cabin, what chance is there of hearing the anchor chain graunch in the stemhead when the boat drags its anchor? Otherwise it's an aft cockpit sailboat for me.